Enriched with years of experience in the industry, we are engaged in offering Pneumatic Air Filter Regulator. - The element and the bowl are in one piece. Replacement can be done in hand. Backed by a proficient team, we are able to timely deliver Pneumatics Regulators that comply with international standards of quality. We can make these pneumatic regulators available to the clients in various models and series, as per their requirement. These pneumatic regulators come with the assurance of longer working life. 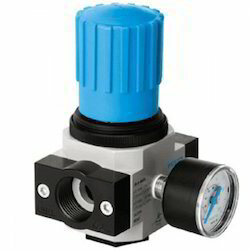 We are one of the leading organizations in industry known to offer high quality Pneumatic Regulator. The offered range is generally used in pneumatic engineering in different commercial and industry applications. We offer this product to our customers at reasonable price in the market. With sincerity and hard work of our professionals, we have carved a niche for ourselves in this domain by trading SMC Regulator. We are one of the celebrated exporters, traders, suppliers and wholesalers of an extensive assemblage of Parker Regulators (R).